Would you like to join a horse racing tipster service knowing that if you follow their tips, you will make a profit (after the subscription fee) every 90 days? There are thousands of horse racing tipster sites out there, and 90% of them are in fact useless. We know that most recreational punters fail to win money because they stop following the tipster after a run of losing tips. To overcome this problem, we advise dipping your toe into the world of professional tipsters by subscribing first to tipsters with good strike rate (greater than 20%) & a good return on investment (greater than 15%). Why do this? Keep doing this until you have a stable of 5-10 tipsters and you are consistently bashing the bookie and acquiring wealth passively! When we analyse a tipster, we first look to see if it has a proven record over the long term. To pass this, the tipster must have a consistent upward curve. We then look at the current form to ensure the growth rate of the last 90 days is similar to the growth rate of the previous 90 days. Finally, we look to see if real people have reviewed the website and if the owner is trustworthy. We do this by finding real testimonials, having actual interviews with the tipster or by running case studies on their service. If you are a loyal reader of our website, you would have seen our tipster portfolio case study. The aim is to make £500 per month net profit from professional tipster services to £10 stakes. We wanted three tipping services that matched the criteria mentioned above. In our case study, we liked to label our three tipsters low risk, medium risk and high risk. Our medium and high-risk tipsters were our best and consistent performers (Tip of the hat to Lucky 7 Naps & Fantastic 8s!) however our profit rate was hindered by our low rate tipster. In year 1, to just £10 stakes, we made £3,211.33 net profit. That’s an all-inclusive holiday paid for right there. Here is exactly how our tipster portfolio performed in year 1. Now before you get carried away, we did, in fact, fail in our goal to make £500 per month to £10 stakes. However, we did make £267.61 per month net profit which puts us ahead of 98% of punters. Due to the success of year 1, we continued the case study in August 2016. We had to sort out our low-risk tipster issue. We had been paper trialling a service which met all our criteria as mentioned above, so we started with Quentin Frank Racing in August 2016. We have now concluded year 2 and you can check out these results for yourself. As you can see it has been an amazing year two. To recap here are the results broken down by year. Obviously, we could have made more money if we reinvested the profits into our betting bank and increased our stake size. We are now exceptionally happy with our current portfolio of tipsters, and we think we can continue the average net profit of £500 per month in year three of this case study. The service has been in operation since July 2014. Look at the latest growth graph. As you can see, Quentin Franks has shown an outstanding ability to tip winners and make his subscribers money. But look at the period between February 2015 and July 2015. Franks had a downswing and barely broke even at this time. Imagine if you had signed up in February 2015 and saw no profit for four months! You would have probably quit and decided he was an awful tipster. Understanding that these downswings, or horizontal periods, will always take place is key to betting successfully. You will also see periods of extreme profitability. Look how well Franks did between June 2016 and November 2016. When you get to grips with variance and bankroll management, you become a winning punter. It is as simple as that. Quentin Frank Racing has made £166 in the past 90 days to £10 bets. In the previous 90 days, he made £117 to £10 bets. He is definitely having a dry run but you can also see he had a similar dry run between Jan and Aug 2015 and he recovered as expected. As long as he is covering the cost of the subscription, we are happy to wait for the big months which are sure to come. Part of the Betting Gods Tipping Stable who are the most trustworthy tipping network in the UK and has been reviewed in national newspapers. We rate Quentin Frank Racing as an A+++ tipster service. The service has been in operation since March 2014. 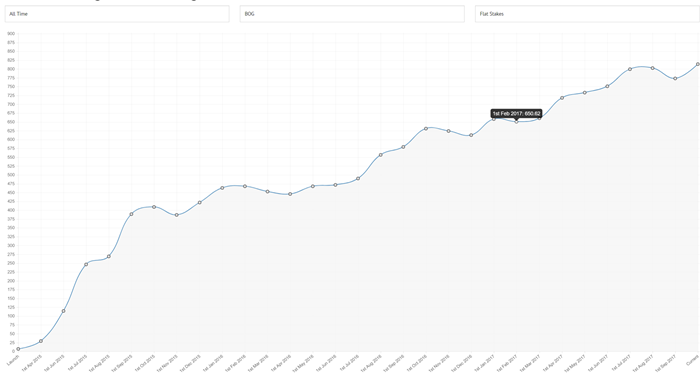 Look at the latest growth graph to level stakes profit as it is a true representative of the tipster’s ability. Lucky 7 Naps has made £1,252.80 in the past 90 days to £10 bets. In the previous 90 days, he made £1522.80 to £10 bets. From the graph, you can see that this guy is the most consistent tipster on the planet and he is on fire for the past 12 months (not just 6)! Part of the Betfan Tipping Stable who only employ the best horse racing tipsters and independently proof their results. We currently rate Lucky 7 Naps as an A+++ tipster service and delighted to have him as part of our Pro Tipster Portfolio. The service has been in operation since March 2015 and therefore scores an A+. 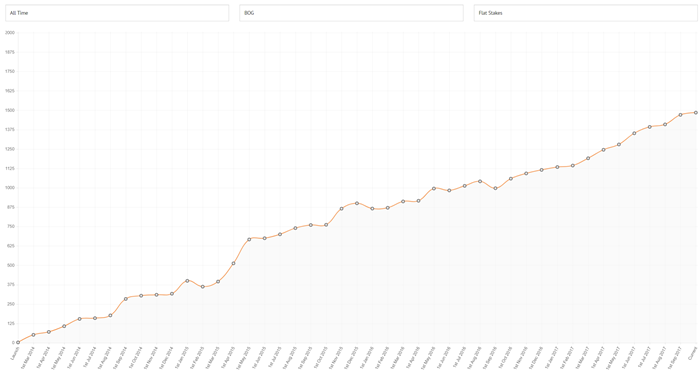 Look at the latest growth graph to level stakes profit as it is a true representative of the tipster’s ability. Fantastic 8s has made £177.70 in the past 90 days to £10 bets. In the previous 90 days, he made £905.90 to £10 bets. You can tell that he is in a small downturn at the moment but still profitable, and historically he comes out of these strongly. The smaller strike rate naturally lends itself to higher variance. We rate Fantastic 8s as an A+++ tipster service and duly qualifies for our pro tipster portfolio. It is possible to make money betting even if you could not tell the difference between a horse’s head or backside, by using professional tipster services. The main thing to do is to pick at least three proven trustworthy tipsters to help reduce downturns and to be disciplined with placing all the advised bets quickly and getting the best price possible each time. We have proven it is possible with our Pro Tipster Portfolio Case Study, so if we can do it, so can you. Here Are Our Top 3 Recommended Tipsters Once More.